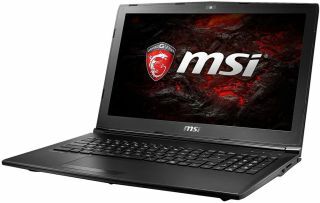 One of today's Shell Shocker deals at Newegg is for a 15.6-inch MSI gaming laptop (GL62M 6RD-058) that pairs an Intel Core i5-7300HQ processor with an Nvidia GeForce GTX 1050 GPU for $799, down from $899. If you apply coupon code NAFCRPTF01, it brings the price down another $30 to $769. This isn't the fastest laptop in the world, but for the price, it's a decent bargain for 1080p gaming on the go, which is the display's native resolution. The laptop comes with 8GB of DDR4-2400 memory. For storage chores, MSI pairs a 128GB SSD with a 1TB HDD. On the connectivity side, it has a pair of USB 3.0 ports, a USB 3.0 Type-C port, a USB 2.0 port, HDMI and mini DisplayPort outputs, 802.11ac Wi-Fi, and Bluetooth 4.0. Other features include a 720p HD webcam, SD card reader, four built-in 2W speakers, a headset amp, and a SteelSeries keyboard (no backlight). The sale is good for today only. You can find the laptop here. If you have a little more to spend, you can select the GeForce GTX 1050 Ti option, which bumps the price up to $898.